The dinner party has long been a reliable setting for a comedy of manners or nightmarish descent into hell. 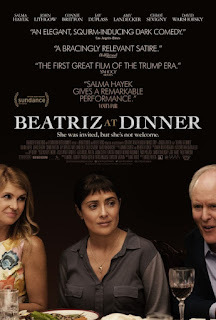 BEATRIZ AT DINNER falls somewhere in between, with Salma Hayek as the titular Beatriz, a massage therapist who is the accidental guest at an elite soirée hosted by her wealthy clients. The film was written by Mike White, a writer, director and sometime actor, and directed by his frequent collaborator Miguel Arteta. It's an unusual chamber piece that touches on corporate greed, animal rights, immigration, social inequality and spirituality. While not entirely satisfying as a linear narrative, it's beautifully filmed, thoughtfully written, and well acted. We first meet Beatriz as she prays, cross-legged, at her candlelit altar at home, where she also tends to her dogs and several goats. She works at a cancer center, performing massage and Reiki on patients before driving along a smokestack-marred L.A cityscape, to the gated community where her client, Cathy (Connie Britton) lives. Cathy met Beatriz when her daughter was recovering from cancer; Beatriz's healing touch worked miracles on the girl. (The daughter is away at college in Ohio. “Why would you want to spend four years of your life in Ohio?” Cathy wonders). Beatriz has a special love for animals. She tells Connie a neighbor, who objected to her keeping goats (“they bleat a lot”), killed one of them. “I could feel his pain!” Beatriz laments. Also in attendance are hotshot young lawyer Alex (Jay Duplass) and his girlfriend, Shannon (Chloë Sevigny). They are celebrating a legislature's approval of a major development by Strutt's company, with the helpful machinations of Alex (“He had to fellate every state senator!” Strutt says proudly). Beatriz is clearly out of place at the fancy dinner, because of her blue jeans and rumpled shirt, her class and ethnicity. Strutt initially mistakes Beatriz for a servant, then asks if she's in the country legally. As the men boast about money, deals, “clearing the land” and combating environmentalists' protests, Beatriz listens silently, her brown eyes darting. She is equally alienated by the women's chatter about vacation homes and the latest viral celebrity scandal. 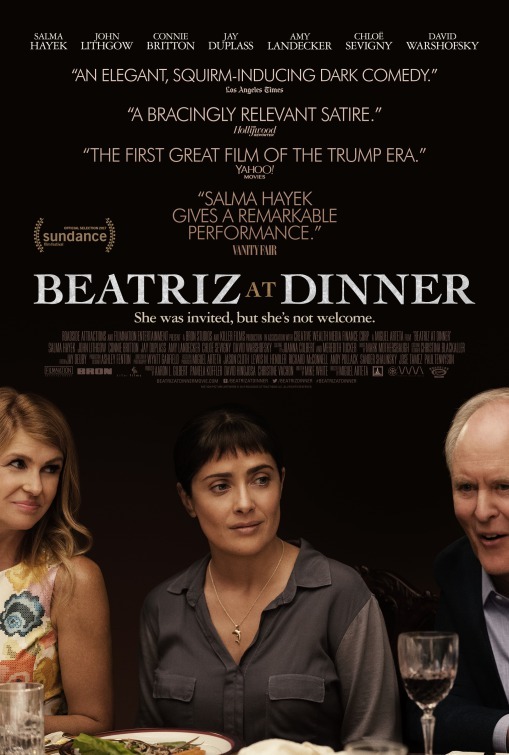 Tension builds at the dinner table as Beatriz's spiritual philosophy clashes with the wealthy guests' complacent privilege. The dialogue is not as dialectical as you might expect; White's screenplay is nuanced enough to avoid black-and-white characterizations. (Semi-unrelated note: White had a production company with Jack Black called Black and White, which produced School of Rock . ) Strutt is brash but also — unlike Trump — witty and self-aware. He jokes about possible titles for his autobiography: “Life Is a Game and Guess Who Won,” and “This Can't Possibly End Well.” Cathy and Shannon are spoiled but not unsympathetic within the boundaries of their wealth. Beatriz is principled, but also a little unhinged, like the Laura Dern character in White's excellent HBO series "Enlightened", an emotionally fragile woman who jeopardizes her career to become a corporate whistleblower. Or the Molly Shannon character in White's YEAR OF THE DOG, who sacrifices everything to fight for animal rights. As the evening proceeds, Beatriz suspects that Strutt is the resort builder who ruined her hometown in Mexico. When Doug boasts about his latest hunting conquest, and shows off a cellphone photo of himself with a dead rhinoceros, Beatriz erupts, throwing the phone across the room. Having made “a scene,” Beatriz is sent to the bedroom, returning briefly to play and sing a song for the guests. The scenario darkens, and the film begins to echo Jordan Peele's GET OUT. White's female protagonists seem to be versions of himself. Enlightened was based on his own meltdown while working on a TV show and subsequent exploration of Buddhist meditation. And, like the flawed heroines of Year of the Dog and Beatriz, White is a vegan and animal rights activist. If BEATRIZ's conclusion seems arbitrary, it could be that White's ideas are too large to be contained by the simplicity of film narrative. The painterly cinematography by Wyatt Garfield (BEASTS OF THE SOUTHERN WILD) is an essay of symbols that reflect White's philosophy: the moon, smokestacks, Beatriz's beloved animals, fire lanterns shooting into the night sky. 3 1/2 out of 4 stars.